We need a budget friendly living-dining room combo. I loved Sunday’s post with all of the cool furniture you found from Etsy, Ebay and other online sources. I thought it would be cool if you could elaborate on that board you did with the sofa for $1,500. The style of that room really speaks to me, but I live in a smallish home-built in the 30’s and because the previous owners expanded the kitchen, the living and dining room are one room. We have $10,000 – 15,000 max with shipping/handling and tax to do both areas. Oh, I forgot to tell you something a little bit important. I need to have it all together by mid-June. My mother-in-law is coming for a week. To be clear, in case you guys don’t know… Ima Nuttzshob lol is a fictitious character but one who definitely exists. In fact, hmmm… she could have been me some years ago. But I created her so that I could build on what was started last Sunday. Here’s the board again with some of the furnishings. Let’s begin at the bottom with our area rug. And let’s do the most attractive one there is for the least amount of $$$. If that doesn’t bother you and your mother in-laws eyes aren’t that sharp, then this is a fine rug, I’m sure. And blimey. It’s only 250 bucks for a 9 x 12! Let’s do the beautiful vintage Thomasville sofa from Chairish. And how about a couple iconic Chiang Mai Dragon pillows. Love the colors! This one is from Motif Pillows. You MUST check it out over on Etsy. It is one of my favorites and they have so many gorgeous pillow covers– very reasonably priced. You can see them here in the kitchen we did a couple of years ago. They are very pretty! This is a vintage Baker cocktail table found at One King’s Lane. So unusual and it’s a little expensive for the budget at $1,295.00. But maybe we can make it up elsewhere. This is also a cool vintage Baker Chinoiserie cocktail table with a parquet top found at Bucks County Estate Traders on Etsy. This might very well be my favorite source on Etsy for vintage and nearly antique furniture. They have a beautiful and large collection. These faux bamboo chairs are cool and depending on the floor plan could use them alone and/or add the ones below, or use them alone. Yet another fabulous source on Etsy. Erin Lane Estates. I know I keep saying that, but this is another must see shop. These two beauties look to be in great condition. Their upholstery is neutral enough and at $600/each they are a very good buy. I’m loving our vintage neo-classical stools if there’s room in the budget. Sometimes we just need one occasional chair. How much would you pay for this lovely Regency style chair for the 1960s? $700? $800? How about $325.00? That works! I know… The upholstery is pretty awful— well, exceedingly dated but in a funky kind of Anthropologie way. So, it could work, except I have a feeling the fabric looks a little ratty in person. Therefore, either a reupholstery or a slip cover would be awesome too. One other option if money is super tight is to paint the upholstery. YES! You can paint fabric! By the way. The way I did it, is not advisable. It’s okay because I diluted the paint hugely. But it’s best to use paint that’s meant to go on fabric. I do love these little faux bamboo chests that could flank a fireplace if the wall isn’t too large or go in front of a window or flanking a wide door. I would not have more than about a foot of wall on either side, at the most. Over these if not in front of a window, I would put two mirrors or two pieces of art. 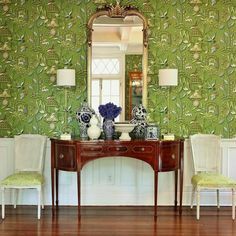 The Madeleine Mirror from Anthropologie is beautiful and just the right size for the chests. And they are only $298.00/ea. I know that we had a little controversy about ready-made drapes. First of all, we need to use rings and a rod. For my sources for custom rods click here. These are from Anthropologie and what I’m going to make up is that there are three windows— two in the living area and one in the dining area. These are actually $268.00 each. I don’t think that’s for a pair but not 100% sure. But here’s what I’m thinking. Let’s do the one panel with a hold back like shown. And then add a cool bamboo shade underneath. Sorry jumping around a bit. 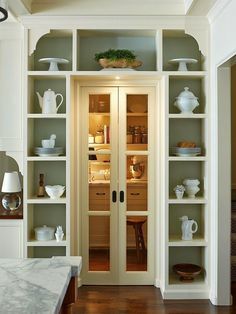 Instead of the chests in either the living or dining area, we could do these wonderful bookcases, below. I would probably paint these if the walls are pale. They measure – H: 47″ x W: 36.5″ x D: 10″ So, if doing a mirror over this it needs to be wider and maybe not so tall. Round mirrors look terrific. Wisteria has a fabulous collection of mirrors and at reasonable prices too. Heritage Henredon in Ebay for $950.00! Okay. Yes, the two-tone thing is a little odd– but I’d get me some Annie Sloan chalk paint and turn these handsome beauties into two treasures. These could go in the living room– or if there’s a center doorway, (to the kitchen in this case) possibly in the dining room. They have a pull-out shelf and the storage is terrific for linens, etc. Above and below, a little inspo from Darryl Carter. I meant to have this picture Sunday when we were talking about the Federal mirror. Yes, please. Can I have this? Now, for the Dining Area. We’re going to need a table and nice tables can be very expensive! Sure, the finish is a little light. But maybe get some of that Restore A Finish in a darker color to deepen it a little. I said MAYBE, because I’ve never done that and don’t know if it’ll work. But my guess is that it will. And how can you go wrong? Of course, there are tons of dining tables on both Ebay, Chairish and Etsy and of course other places. But let’s look at dining chairs. We could do these chairs from Sunday’s post which are a steal and well within Ima’s budget. These classic Chippendale (not Chinese Chippendale) – Mahogany – almost black dining chairs for $2,400 for the set are well-worth the money. They are beautifully scaled too. I would put a little slip-cover skirt on them. Or we could do these lovely Hepplewhite style chairs from Bucks County Estate Traders. They are only $1,575.00 for the set of eight. wow! I might paint these chairs. The original Hepplewhite chairs were often painted. They could also have a slip cover or new upholstery. An original Hepplewhite chair on 1st Dibs. What a beauty that is! If you don’t have enough chairs, sometimes you can mix styles. Or, if you prefer an upholstered chair… Well, there’s always the Ikea Henriksdal chairs. And then you could do a cool slip cover from Bemz. (you can find this in Laurel’s Rolodex on page 29) They have dozens of fabrics to choose from. However, I would prefer to have this skirt about 5 inches shorter. They also make a long version and then one that just covers the seat which is also nice. Here’s an example by Suzanne Kasler of chairs that look great together. Oh, and a gorgeous slip-cover over the chair in the middle. This chandelier on Etsy from 5th Ave Kitsch is a little over-budget at $1,100. But sometimes it really pays to splurge on one fabulous piece that’s going to make the room. Well, I think we did it in terms of staying within the budget. And I think quite a stylish room that Mom will find impressive! Well, let’s hope so! But of course, the most important thing is that you and your family love it! Laurel I loved this post so much. I bought the two chinoiserie lamps you’ve pictured above and they are FABULOUS. They are more square than they appear, so if anyone is looking at these make sure your buffet is deep enough to accommodate the square shades. Speaking of budget… can I get your opinion on this company, Laurel? Is this cheap Chinese knockoffs? Hard to tell from the photos. Sometimes this stuff looks super tacky in person but nice in photos. Prices are even cheaper on ebay from the same company. Know anything about them? They are in Norwalk, CT.
Love the theme of this post and your “finds” to solve the problem. Skinner is an auction house with a location in Boston and a location nearby. Bid online or go in person. Here’s an example of a just sold ($750) lot of 2 Louis XV-style bergeres. They look(ed) like mohair upholstery. I know someone who bid -unsuccessfully. 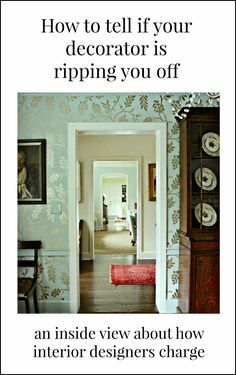 I am not sure why I feel the need to confess…When I read your blog this AM and saw the seagrass rug I looked into the next room and was horrified to find stitches and un-mitered corners. As I scrolled I saw where it was from…Yup, that’s the same as mine. Went into the LR/DR. I bought those rugs in a more upscale store in Atlanta and paid more…Same as the keeping room rug. I guess I am telling you this for your readers who don’t want to spend a lot. I am very happy with these rugs. They have held up beautifully. My tip of the day is if your Dog or Kitty yaks on them, let it dry and scrape it right up with a knife. Great post as usual! Oh, don’t be silly. It’s a small detail and it’s only because I’ve been selling these things for a while that I know this stuff. Actually I learned about the mitered corners from my “apprenticeship” in the ’90s. Just a perfect blog…love. There are so many wonderful pieces of great quality than be restored/reused. Oh how I wish you lived in the DC area Laurel!! I would have hired you “yesterday” to help finish decorating our 1890 brownstone. I am in the place I’m in partially because I had moved and my phone was not ringing at all. That was four years ago. And now I can’t get it to stop but I’m not taking on any new clients. I actually took the day off– but even so, as you can see, there’s never even one full day off. There is such a thing as a service that breaks down larger pieces of furniture– even sofas and then puts them back together again once it’s in it’s rightful place. Perhaps a sectional would work better. Sectionals also come in more petite sizes. I would look at Lee Industries. What an interesting post, Laurel. All great sources! I wanted to add-checking your local Craigslist is good too..for example we found there a very similar dining table for my MIL but for 250 I think.. sometimes you can find really, really good deals. I found one of my most favorite lights like that..it was a wonderful chandelier, and the sellers wanted just 70 dollars for it. Well little did I know..months after, I open 1stDibs just to look and admire from afar, and I see a version of my chandelier, same exact glass, and the description says it’s bohemian glass from thirties, and the vendor wants 9K for it. I almost fell off the chair. I love Etsy dearly(as I do eBay too, but eBay is less personal), the furniture might be problematic though if the store is not in your area..shipping. I did buy smaller things there like easy chairs and ottomans. PS I feel so blessed, being daughter in law of my MIL..she’s so sweet and never sees anything she doesn’t like. The last thing she would pay attention to is the binding of a rug. I’m different though. That’s why I bought just one rug by now..it’s three by five and I put it in the guest bathroom. It’s hand-knotted wool. Very sturdy. Survived a slab leak. looks like new. Of course now I don’t want any other rugs but hand-knotted wool..doesn’t leave much hope for fast rug purchasing lol. Yes, Craig’s List is great too but I can’t post images from CL since there’s no central point. Shipping IS expensive whether the furniture is new, old or whatever. In fact, here’s the proof. I’ve had clients look at me like I’m ripping them off with the shipping charges when in fact, no, I’m actually eating part of them! Great post! I have been a dealer on Chairish (as well as RubyLane, eBay, &The HighBoy) for four years and I have a couple suggestions. Make an offer – you can often get things for 10-25% less than ask, sometimes even less. Be aware the seller pays 20% of the accepted offer to Chairish so be reasonable, but try making an offer: nothing to lose and you might save a lot. Sometimes dealer-sellers on Chairish can get you a shipping price lower than the big national carriers that Chairish uses, so ask about that too. But if the piece you love is on the opposite coast, it is often still a good deal even with shipping. Shipping across country can take several weeks, so just be forewarned. Another cheap source is Apartment Therapy Marketplace, formerly Krrb.com Kind of a better Craigslist. Leans to modern, easy to filter for nearby locations. Also the new curated consignment stores have great deals if you have time to drop in and look. The best ones are selective, put together nice displays so you can see things, and can deliver. They do not have to pay for inventory and want to turn merchandise often, so prices are very competitive. Finally, as Laurel’s imaginary room here shows, there are especially good bargains right now in high quality traditional reproduction furniture from the 20th c., especially for dining rooms. Reasons? Lots of people are downsizing, lots of people are skipping dining rooms, and there is a mass trend toward modern. So If you are doing fresh, stylish traditional decor like Laurel’s, there are great opportunities in vintage solid wood dining tables and chairs. I’m not suggesting wall-to-wall mahogany like my grandmother, but a chic mix of wood and painted like Laurel’s can be had for a very reasonable price, and possibly some elbow grease for the painting. Amazing comment, and yes, definitely so when it comes to older furniture..young crowd is not into it just yet, so the best time to grab it is now. Dining sets, beds, and especially-armoires. Armoires will get as popular as MCM did..after I discovered it for myself lol..mark my words. I love Ruby Lane too. And they are featured in my paint palette guide as I used some of their antique lighting on a few boards and linked back to them as well. Love. I wiiiiish you could put this room together in real life so we could see!!!!!! Everything is gorgeous. 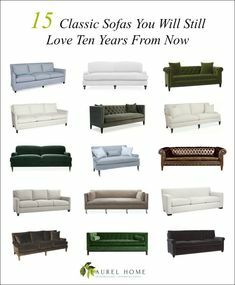 That thomasville sofa holy DROOL!! I seriously can’t handle how gorgeous that sofa is. I may have to purchase and hide it somewhere til we have a room that would fit it. Also I’ve been stalking charish for a vintage dining table, didn’t even think about Etsy or eBay. I have 10 antique cane back all arm chairs painted cream upholsterered sand and don’t have a table to go with it because I cant decide. I don’t know what looks good with my chairs (and also need clearance under skirt for all armchairs). Before I got full-throttle in thanking Laurel for another GREAT post…re Lisa’s query: There’s a place near me that still has a LOT of the Pierre Deux fabrics in stock: Leonard’s Upholstery on Main Street in Norwalk, CT. Don’t have their phone number offhand, but I’m you can google them. Might be worth a call. It’s a very haphazard place, but lots of stock – if they don’t know the fabric by name, perhaps a picture? First of all, thank you so much for the advice for Lisa! Hope it works out! That would be so cool if they have the fabric. love your site so honest, fun and informative ! Oh, this is terrific! I definitely will take a closer look and should add this to Laurel’s Rolodex. She didn’t have to convince me—-you’re amazing!